The fifth round tie of the Tennent’s Irish Cup has thrown up a mouthwatering ‘Big Two’ clash. Glentoran will host Linfield in the tie of the round after they were paired together by former Blues striker Peter Thompson and ex-Glenavon defender Paul Byrne in Tuesday lunch time’s draw. 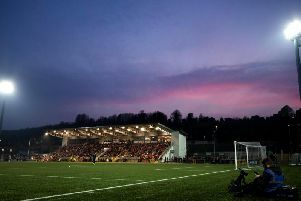 It’s one of four all-Premiership matches with Coleraine entertaining Carrick Rangers, Ballymena hosting Cliftonville and Crusaders travelling to Ards. Elsewhere new Portadown boss Niall Currie will take his team to Larne, and cup holders Glenavon have a home tie against Intermediate League side Portstewart. Fivemiletown and Trojans both feature in the fifth round for the first time ever, with their respective rewards a trip to Loughgall and Armagh City. The ties will be played on Saturday, January 7.